Watermelons are in season at the moment in India. I have made this salad umpteen times as its very refreshing, cool and different from the conventional salads. Usually, I keep the watermelon cubes in the fridge till required. Use up your not so sweet watermelon as a salad. Rich in potassium and Vitamin A, low in calories so go on and have this for lunch till the season lasts. Cut the watermelon and keep in the fridge till required. Chop the mint leaves. Pat dry the spinach leaves on a kitchen paper towel. 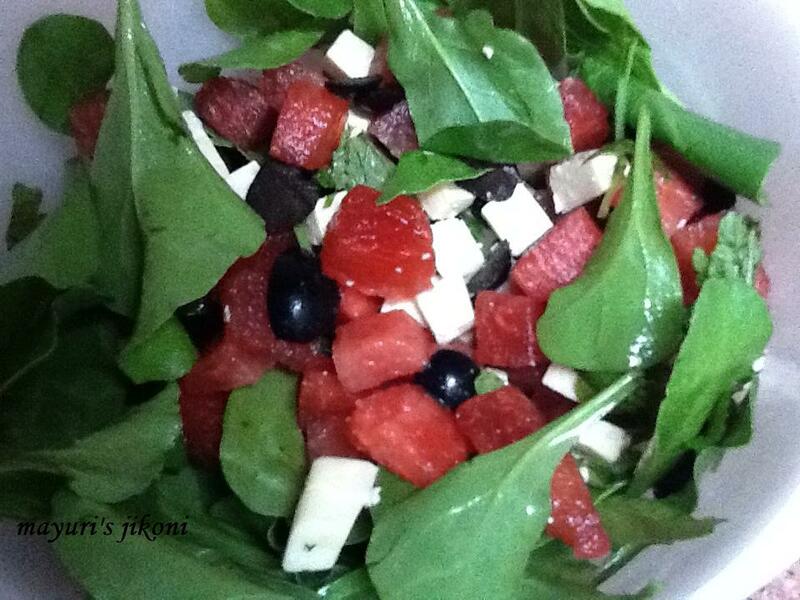 In a bowl mix the feta cheese, olives, spinach leaves and mint. In another bowl mix the dressing. To serve add the watermelon and dressing and toss the salad gently. I had difficulty finding feta cheese in India. So instead of feta cheese I added paneer and it tasted good. Some high end supermarkets do sell it but its very expensive. Can add thin slices of a small white onion. Can add chilli flakes if you like. I had to pick out the tender and small leaves from a normal palak bunch as baby spinach is not available in India. It tasted equally good. If you are serving this salad for a larger party, leave the dressing on the side as the salad tends to get watery very quickly.